From today, the new method is available for password recovery – via e-mail. Navigate to “Password Recovery” tab in the “User Profile” section to set up this new functionality. To activate this function, You must specify and verify an additional e-mail address. Verification will take a couple of seconds – You need to log in to the specified mailbox, open the letter from Inbox.lv with the topic “E-mail address confirmation” and follow the link. 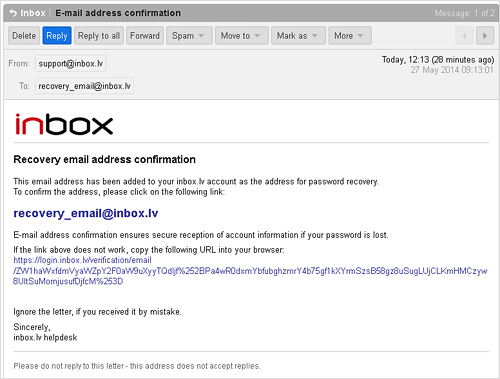 Upon success, the e-mail address will be linked to the inbox.lv password recovery service. You can use any available e-mail address for verification. This method is not mandatory, but Inbox team recommends using the additional option to restore access to Inbox.lv. In any case, the password can be restored via answer to the secret question or referring directly to the technical customer support Inbox.lv. This entry was posted in About our products and tagged password. Bookmark the permalink.